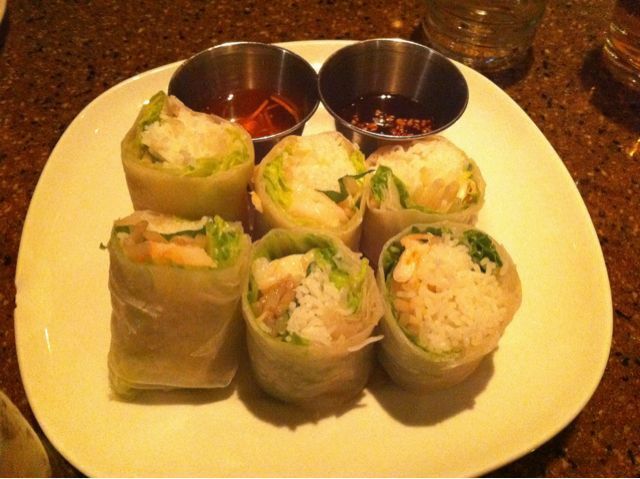 The shrimp summer rolls from Saigon Grill. Ordinarily, the crew of friends I was with would’ve headed to Keen’s for steak. It’s something of a tradition with us. However, one of our company was on a more restrictive budget, so we headed to the ever-reliable (if somewhat evil) Saigon Grill. Why somewhat evil? Because the owners of Saigon Grill were found guilty of exploiting their employees, woefully underpaying and overworking them and generally engaging in bad practices. With that in the background, it’s a moral choice to eat here – I boycotted it for some years (my taste buds have yet to get over it) while all this litigation was playing out. I was greatly relieved when the judgment came down, since now the restaurant would need my support in order to remain in business and rehire all those exploited workers. So now I feel as though I’m participating in a civic good. Detail of the shrimp summer rolls. 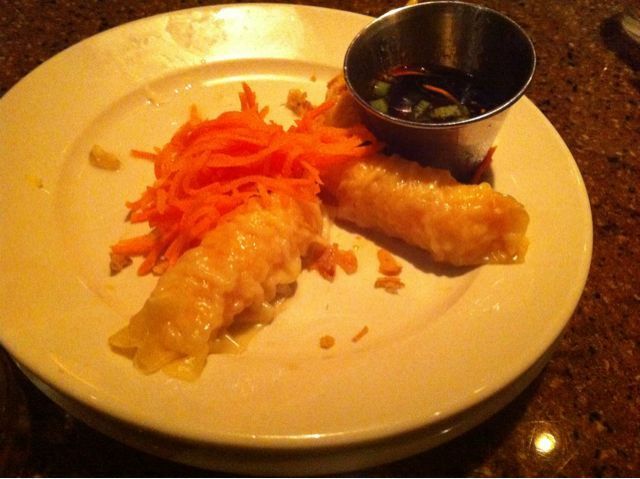 We started with the shrimp summer rolls, which I love. 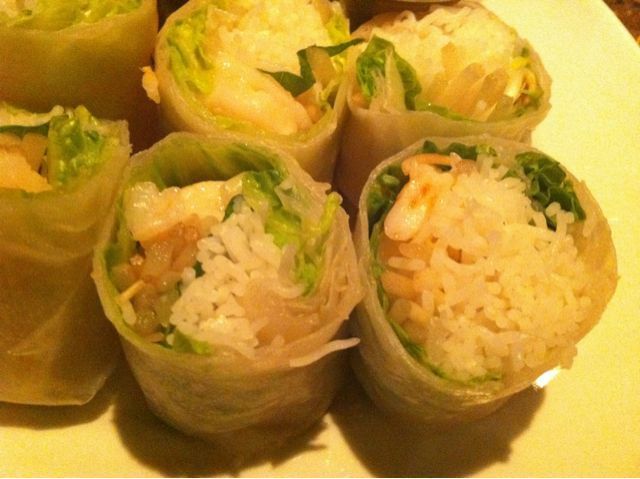 They are served chilled, within a thin, rice pancake encasing shrimp, vermicelli, bean sprouts, lettuce and touch of mint. Dip in the peanut plum sauce – so delicious. 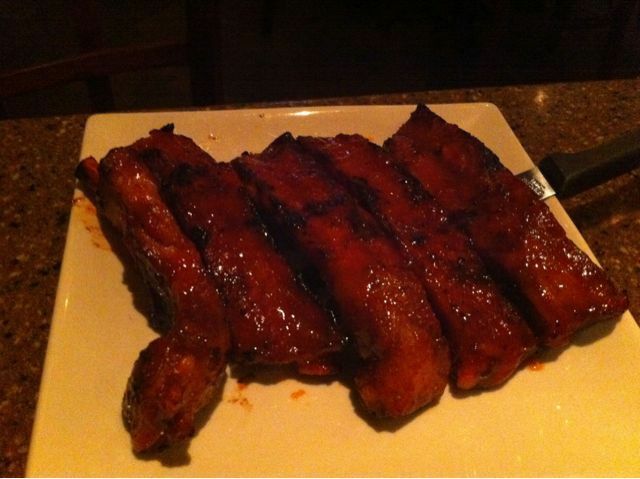 Spicy & sweet ribs from Saigon Grill. Since one of our number is opposed to eating shellfish (something to do with the bottom-feeding habits of molluscs), we indulged him by ordering the spicy and sweet spare ribs. Everybody loves spare ribs, of course, but I found these a bit light on the spiciness. Nonetheless, the strong pork note was welcome. Steamed shrimp finger from Saigon Grill. I always think it’s a mistake to pass on the steamed shrimp fingers. I realize one of our crew didn’t want to eat shellfish, fortunately these light, tasty dumplings are so easy to devour I didn’t manage to snap a shot until we had almost cleared the plate. They are clad in a very thin dough, are tender and filled with shrimpy deliciousness. Thit xao gong from Saigon Grill. For entrees, we settled on a trio. 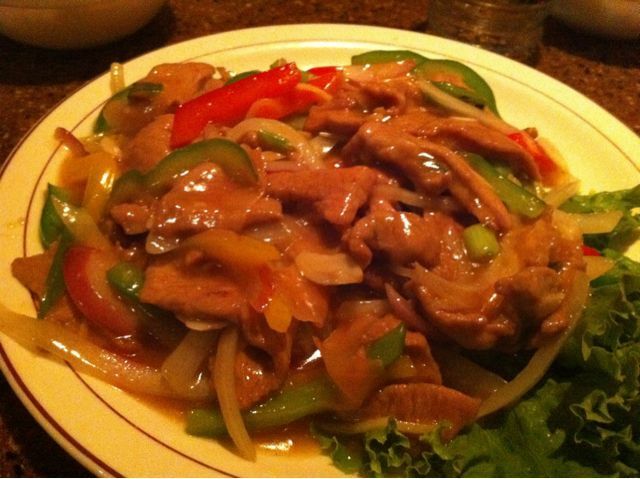 We indulged in thit xao gong, sliced pork in a ginger-honey sauce. It comes with peppers and onions. This is a standard preparation, and the meat can swapped out if you’d prefer chicken or fish, for example. I found it to be a bit heavy on the sauce, myself, and the quality of the thin pieces of pork is nothing to write home about. However, the ginger flavor was a hit with the rest of the crew. Chicken mi xao don from Saigon Grill. My colleagues were interested in a noodle dish – I tried to dissuade them (the devil white flour again!) but it was for naught. Really, I was pushing the delicious ca chien – a whole sea bass prepared with a sweet & sauce, made crispy. It looks a fright but boy is it delicious. Again, no luck. So we got the chicken mi xao don – pan fried egg noodles with chicken and vegetables. I found it utterly unremarkable. Bo luc lac from Saigon Grill. Although I had no luck convincing them to try the ca chien, I was able to prevail on them to get the delicious bo luc lac. 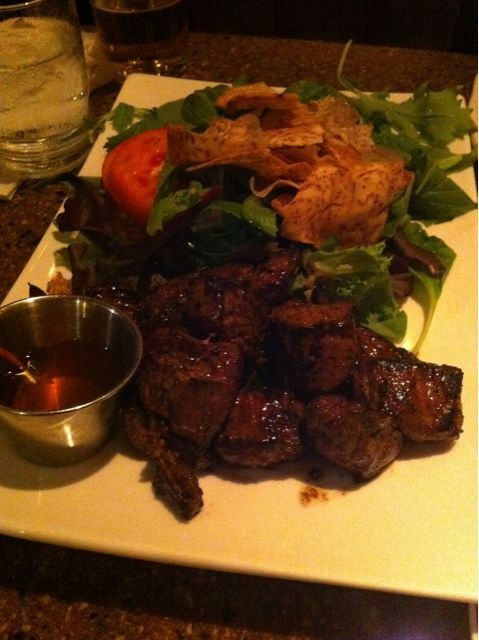 It’s cubes of beef, prepared in a teriyaki sauce, and comes with a small side salad and taro chips. 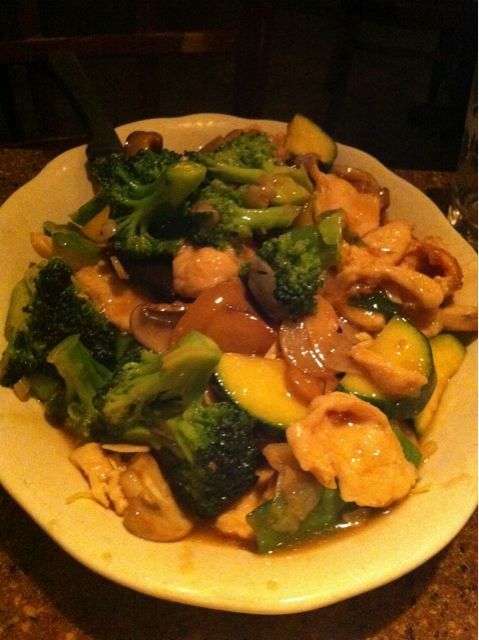 The bo, for me, is routinely the star of the show at Saigon Grill. The cubes of beef are tender and have a smoky note, impressive since they are cooked over gas. My friend joked “You’re going to get teriyaki beef at a Vietnamese place?” but his criticism was quickly silenced by the wonderful dish. For me, it is the star of the show, but for my colleagues, they enjoyed the ginger sauce adorning the pork. Saigon Grill isn’t much by way of decor, and it’s not particularly expensive. We got out of there – with two beers each – for about $100. I love getting Saigon Grill to go as well.